Did you know that some species of honey bees communicate by dancing on top of their combs, aligning the dance in the direction they wish to point their fellow bees? Colony Collapse Disorder makes this unique conversation a little less common. Beginning in 2006, beekeepers noticed that honey bees were less frequently returning to their hives. A rapid increase in collapsing colonies followed. Honey bees are valued economically as pollinators of commercial crops, with an estimated value of $15-$20 billion a year. According to many reports, their pollination is involved in a third of the U.S. diet. The reasons behind Colony Collapse Disorder have so far eluded scientists, although they seem to agree that it is the result of a combination of factors, namely pesticides, a parasite, and stress. A recent study, however, points to another factor: radiation from mobile phones. New research from Punjab University claims that cell phone radiation has been interfering with bees' ability to navigate. 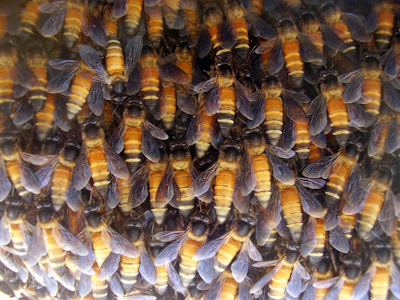 The controlled experiments also found that a hive with mobile phone interference produced less honey and nectar, and the queen bee produced less eggs. Nevertheless, the British Beekeepers Association stated that they have found no link between radiation and the disorder, preferring instead the previous mentioned factors. Hopefully they're right, since beekeepers have begun equipping their hives with GPS systems because of a high rate of thefts. Read more about the study in The Telegraph. And click here to read a January 2010 Congressional report about Colony Collapse Disorder. Didn't know bees played such a role in the US diet. That's a little scary to think that their traditional ways of doing things are possibly being thrown off by cell phones. Makes you wonder what else is being changed by new technology.